Porto Alegre lies in the southern Brazilian state of Rio Grande do Sul and has some 3.5 million inhabitants in the metropolitan area. 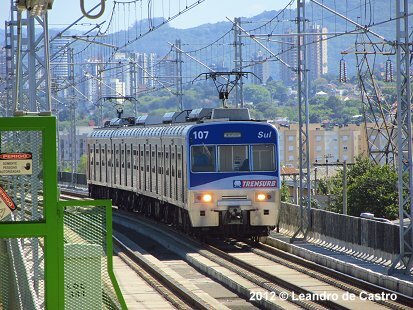 Construction of a surface mass transit line started in 1980 to link the city centre of Porto Alegre to the towns in the north of the metropolitan area, like Canoas, Esteio, Sapucaia do Sul, São Leopoldo and Novo Hamburgo. 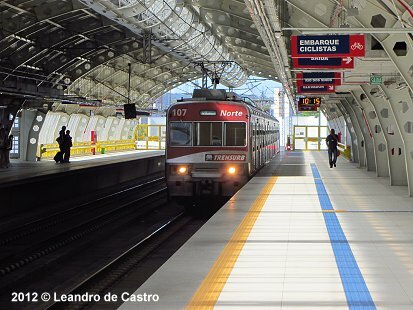 Line 1 was inaugurated on 2 March 1985 between Mercado and Sapucaia. In December 1997 it was extended to Unisinos. 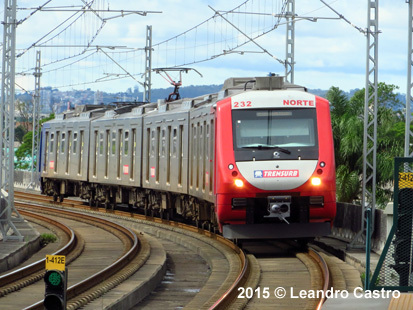 A 2.4 km extension to São Leopoldo was added in November 2000 after two months of trial service. Its current length is 44 km with 22 stations (2014). Average station distance is 2 km, therefore commercial speed is 46 km/h. The longest distance with 3.9 km is between Sapucaia and Unisinos. A trip along the entire line takes 42 minutes. Track gauge is 1600 mm. Fleet of 25 4-car-trains. Platform length 190 m. Overhead catenary at 3000 Vdc. 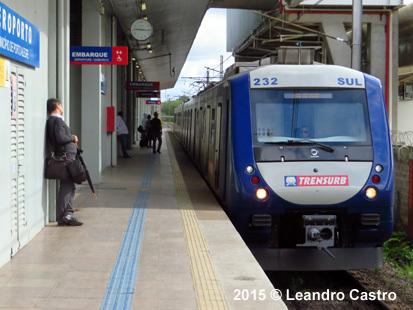 The Porto Alegre Metrô is operated by TRENSURB. 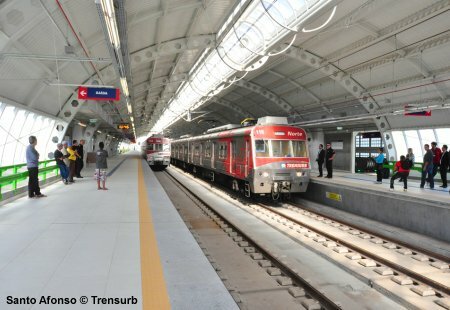 Since 7 May 2014, an 814 m long, elevated air-driven people mover has linked Trensurb's Aeroporto station to the Airport's Terminal 1 (Aeromóvel). 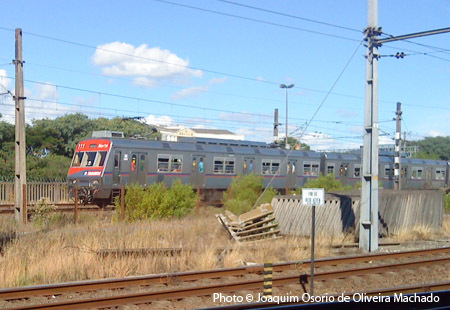 A second 19 km line will serve the eastern suburbs and the city centre of Porto Alegre (from Sarandi to Azenha). 16 km will be underground. Between Aeroporto and Cairu on the future Line 2 a 3.1 km link might be built along Benjamin Constant Ave.